Supercars offer enthusiasts some of the most exhilarating speeds, sounds and ownership experiences available on four wheels. Not everyone can afford to obtain his or her dream Supercar. 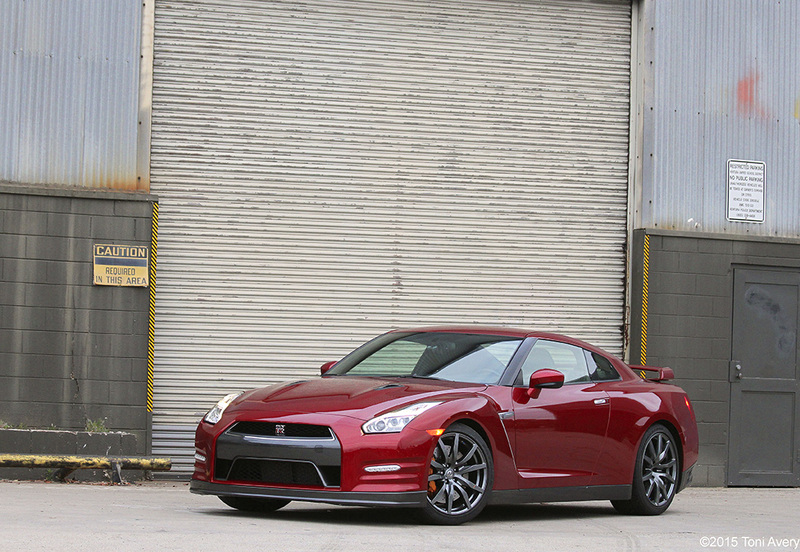 The 2015 Nissan GT-R, or better known as Godzilla, is one of those nearly unobtainable Supercars that collectors both young and old continue to ogle over fantasizing about grasping that leather wrapped steering wheel someday. Does Godzilla truly live up to its competition crushing name? Does its stupid quick acceleration really make you want to sell everything you own just to have one? Hold on to your check books because I had one for five days in varying driving conditions. I’ll tell you what my take is on this red-hot beast. This GT-R is equipped with a 3.8 L Twin-Turbo V6 producing 545 HP @6400 RPM and 463 lb-ft of torque @3200-5800 RPM with a redline of 7000 RPM. Thanks to its massive power output and ATTESA E-TS All Wheel Drive system, this beast is capable of accelerating from 0-60 MPH in just 2.9 seconds. Brembo Monoblock 6-piston front and 4 piston rear brake calipers with full floating cross-drilled, ventilated rotors help to quickly slow the GT-R to a stop. During normal street driving and canyon runs the brakes performed as expected without protest. But does this Supercar take the cake in terms of an all-around performance car? If you live in a crowded and speed restricted city like I do, then no. 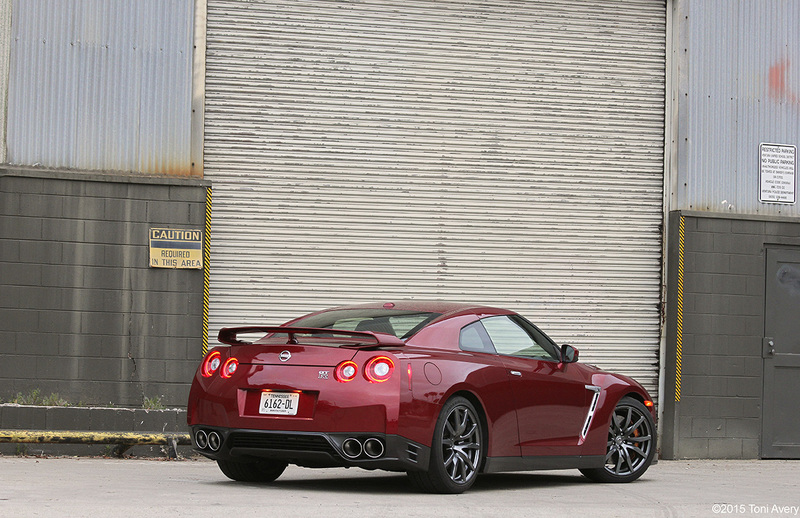 Cruising around town in the GT-R can be just as dull as your ordinary commuter. Not only can you feel just how heavy the car is at low speeds, but the truck-like sounds emanating from the engine are a little disconcerting. Push down on the go-peddle at low speeds in auto mode and the car takes a while to wake up. 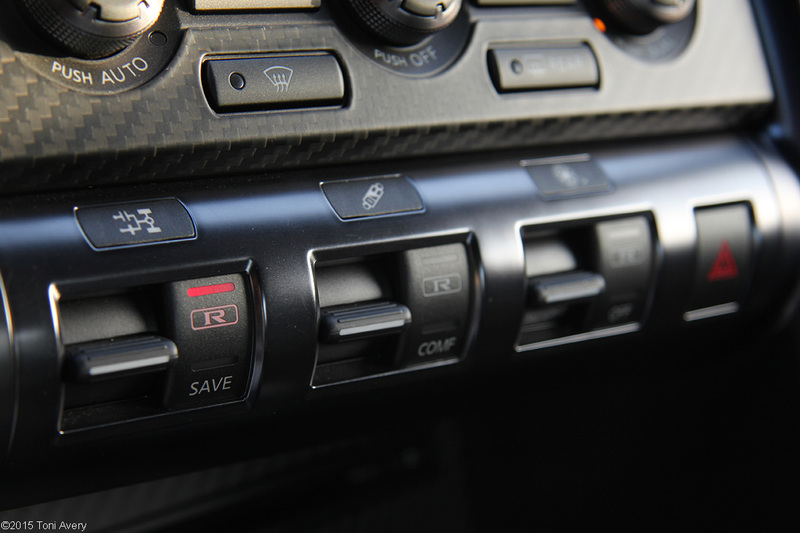 I would never take the GT-R out of manual shifting R transmission mode for any reason. When left in auto, revs change so low in the range (for fuel economy) you might forget you’re driving around in a Supercar. Forget leaving it in auto to save on gas, you’ll go through the stuff so quick your wallet will love you. When you finally do have the opportunity to drive the car faster than trundling speeds, switch over to manual shifting and R transmission mode. 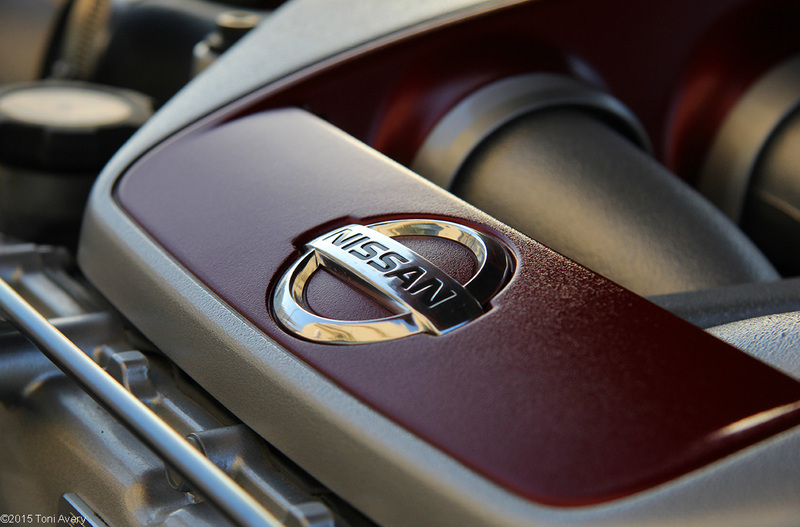 R transmission mode is just one of the great drive mode options at your disposal in the GT-R. The R transmission mode gives you smoother, quicker, and more precise shifts. Shifting in standard manual is quite clunky, especially when downshifting, but by turning on the R transmission mode, shifting is so much more satisfying. Another mode available to GT-R owners is for the suspension. The normal ride feel isn’t too objectionable but there is a Comfort mode to try. Unfortunately, the Comfort mode in my press car wasn’t functioning properly during my time with it and as a result I was unable to try out the difference. The last drive mode adjustment is for front and rear wheel power distribution (VDC). This is one of the settings used when performing launch control. Switch on VDC R mode and the transmission R mode and place your left foot on the brake pedal. Press down on the accelerator with your right foot while the brake is depressed until the revs reach about 4000 RPM and after about three seconds lift off the brake pedal to engage launch control. Launch control simply helps to prevent the rear wheels from spinning so as to get off the line quicker and experience that 2.9 second 0-60 time smoother. While experiencing the brutally quick 2.9 second 0-60 MPH time is something I’ll probably only experience a handful of times, the overall performance of the GT-R was just that, brutally quick. It was a rush I haven’t quite experienced before, as brief as it was. But for me, as an enthusiast, there has to be more than just blindingly quick acceleration. Driving around town has to be at least a little enjoyable. And the exhaust or engine note needs to be remotely satisfying. While I have finally experienced the wonder that is Godzilla, I can’t help but feel something is missing. A driver/car connection? Fun even at low speeds? A wonderful exhaust note? Maybe it’s all those and more, but the GT-R’s performance left me wanting more. As I said in my review video, this car really belongs on the track where it can shine and stomp all over the competition. Having some track time with the car while I had it would have been extremely beneficial to my final decision in rating it. The exterior features LED headlights with signature lighting and daytime running lights. Finished in a Regal Red paint color, the car looks sporty and classic all at once. The entire car sits on RAYS 20” forged aluminum wheels and Dunlop Extreme-Performance Run-Flat tires with a staggered setup. 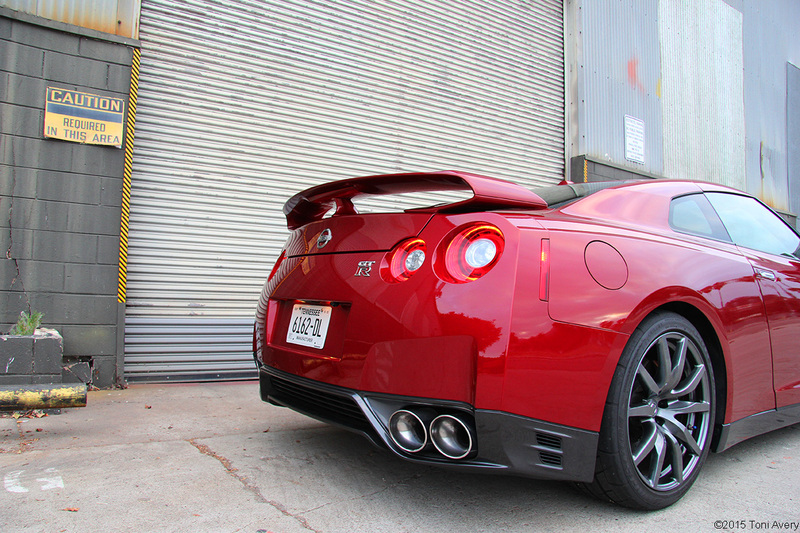 On the outside, this GT-R is stunning and aggressive at every angle. 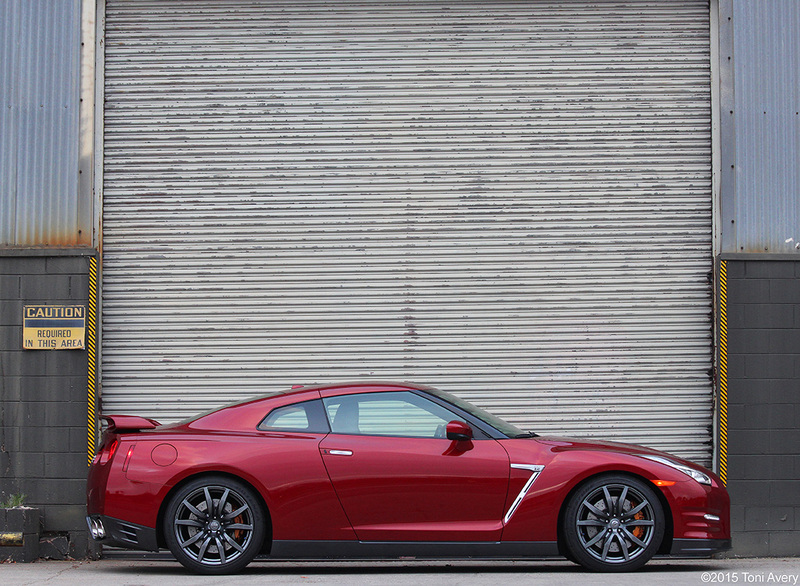 The front is distinctly GT-R while the rear is probably the most iconic and distinctive design on the car. The large exhaust tips further cement its Supercar status and the functional hood vents point to a powerful engine. Inside this GT-R is a sea of black leather and synthetic suede. While the seats are comfortable and the interior is nicely put together, it generally fell flat for me. There was just so much black that it felt cheap. The optional Carpeted GT-R Logo Floor Mats add a bit more character to the interior, but I’d rather opt for the two-tone Ivory/Black interior to liven things up a bit and add some warmth. The rear seats seem a bit like an afterthought with how difficult they are to get in an out of. Being over 5’ 9” tall would be a pain and having someone even taller in front would make the comforts of leg room almost non-existent. Trunk space was ample and allowed for multiple shopping trips without having to drop everything off between stores. It’s perfect for a multiple day getaway or even when you just have a lot of shopping to do. The navigation and infotainment system worked well and the Bose stereo system was easiest to hear while at cruising speeds without needing to blast it. I struggled with what to rate this car from the first hour of driving till the moment I gave back the keys. Perhaps my previous notions of this being one of the best Supercars on the Planet was a bit premature. Maybe it was the fact that its performance fell short of what I thought it should or could be. Taking the car around a track would have made my decision of rating the GT-R for its true potential a lot easier. But as my rating system states, it’s not just about the quality of the interior and exterior or the performance, it’s mostly about driver enjoyment. 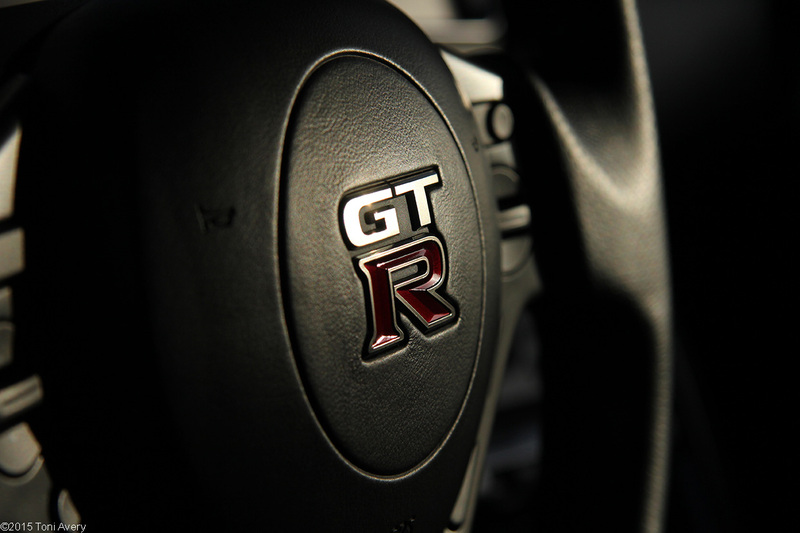 And as a result I have decided to give the 2015 Nissan GT-R the below rating. Does it live up to its given name Godzilla? Around town…not so much. At speed…absolutely. On the track…probably.